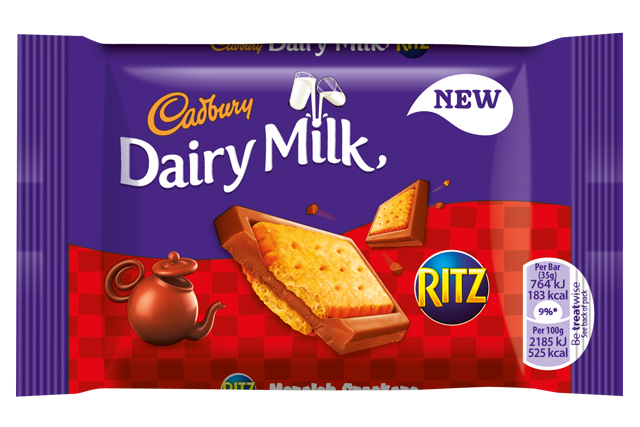 Mondelez has revealed plans for its latest unlikely product combination, which unites Cadbury Dairy Milk with savoury cracker brand Ritz. The food company has released several brand combinations in recent years, including the 2012 'Choccy Philly? Don’t Be Silly' campaign that brought together Cadbury and cream cheese brand Philadelphia. It has also launched combinations such as Cadbury Dairy Milk with Oreo and Dairy Milk with Daim. Mondelez is now rolling out two new bars combining Cadburys Dairy Milk with Ritz crackers and French sweet biscuit brand Lu. The bars comprise pieces of Dairy Milk sandwiched between rectangular biscuits. Matthew Williams, Mondelez' marketing activation director, said: "We’ve been delighted with the success of Cadbury Dairy Milk over the last year, and we’re incredibly excited to be welcoming more delicious combinations into the portfolio. "Cadbury Dairy Milk Lu and Cadbury Dairy Milk Ritz are set to revolutionise the afternoon snacking occasion. We’ve listened to what our chocolate fans want and have developed a chocolate bar that is both new and quirky. There’s nothing else like them in the category and we believe they will bring a fantastic opportunity for retailers to drive impulse purchases during the afternoon dip." A £7.5m ad campaign will support the launch next month. Earlier this month, Cadbury ditched its ‘Joyville’ campaign, depicting a mythical land where Dairy Milk is created, in favour of a new creative strategy. The brand has promoted its flagship product through the Joyville concept since 2012 but a new TV ad will instead show a light-hearted portrayal of a man who is prompted to lip-sync along to "on hold" music by the "joy" that eating Cadbury Dairy Milk brings him.